Green Cleaners, professional eco-friendly cleaning service in Adelaide that offer the highest standards of cleaning to protect health, without harming the environment. They only use carefully selected non-toxic and environmentally friendly products, which means they do not pollute the environment or your indoor air. 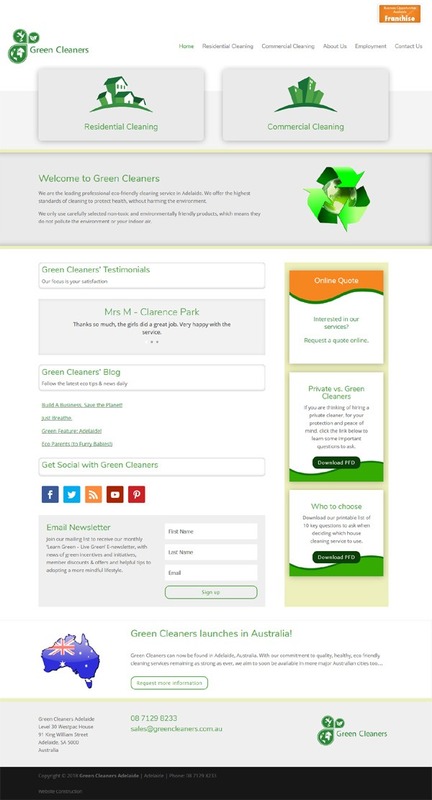 Green Cleaners website needed an urgent rebuilt in WordPress looking exactly the same as the old website and to be launched in a week. Together with Adelaide Advertising we were able to create a very similar copy to the original website but the new one being responsive meaning that it is working nice on mobile and other devices. Green Cleaners now have a website that can grow and easily be updated.